Each passenger long-distance trains need to know their rights and if necessary to be able to defend them. You will be surprised, but they are not limited to the right to the presence of the bathroom with toilet paper and hot water in the boiler. Note: a huge number of people from time to time traveling by train, but unfortunately, not every one of them knows the existence of it in the hands of the ticket grants the right not only to get from point a to point B. in fact, in accordance with the "Rules of carriage of passengers by rail" this man has rights and duties. During your entire trip you will be entitled to a comfortable stay for you paid. Have in mind that you can not sleep only at night, and when you want – no one has the right to prevent you from spreading the bed. If we were talking about the bed, then you have every right not to collect linens in front of his station should do it guide. Moreover, you can ask him to make your bed in the event that if for some reason I can not do that. Know this: you have the right to ask the conductor to make the music in the car be quiet, and to draw his attention to the fact that, despite the prohibition of Smoking in trains of distant following, some irresponsible person is still Smoking in the vestibule. Explorer, at your request, must take action and in that case, if his car someone had been drinking – by the way, not allowed to eat on the train, and his violent behaviour disturbs other passengers. If you or your child purchased a ticket for the top shelf, you can require the conductor special seat belts. Even if he doesn't, they always have in other cars – just need to convince him to go with them. 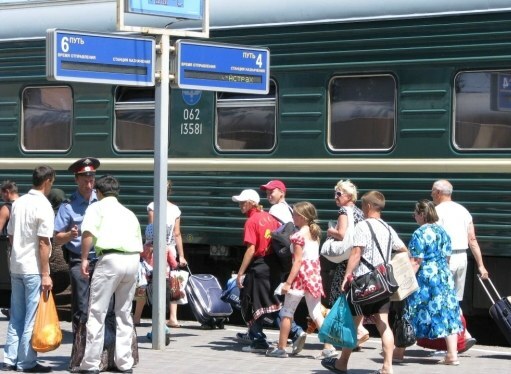 Imagine when boarding a long distance train you have discovered that your according to your purchased ticket – the place is already occupied by another passenger, and his hands also have a ticket to this place. To understand this controversial situation should not you two and the guide and the head of the train. You're entitled to another place in the same train, and, if it is more comfortable and expensive place to pay extra for it you should not. If you gave less than an excellent location, the ticket which is cheaper than yours, then ask to refund you the difference of fare. Let's say you have been lagging behind and he went into the blue distance, taking in one of the cars of your stuff. Do not panic, and urgently seek the head of the station. He will promptly contact the chief of that station in the path of your squad, Parking which will be at least 10 minutes – during this time your Luggage will have time to remove from the train. You have the right to completely free to drive to the station the next train and pick up your stuff. If you somehow miraculously got on the train, in the presence of by his chief act you are free to return to the departure point. The same right you have and in that case, if you drove his station – for example, the conductor didn't Wake you in advance. Remember that you have the right to the conductor to Wake you in about half an hour before the part will fit to your station. Whatever may be said about the conductor is actually part of his duties – a full list you can see in the job description of the conductor long-distance trains, which should be posted next to his coupe. Moreover, their working time, the staff trains bound to be friendly – if the conductor is rude to you, you have every right to complain about him to the chief of the train shall immediately take action. Not everyone is aware of that, having the ticket on long distance trains, you can make free use of pay toilets at the station. It is enough to show it on the entrance.